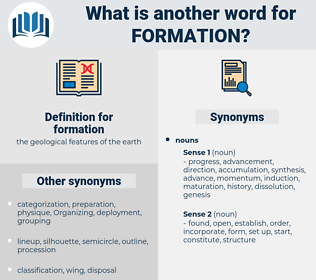 What is another word for formation? Activities, Forming, Resources, skills, awards, formed, constitution, education. 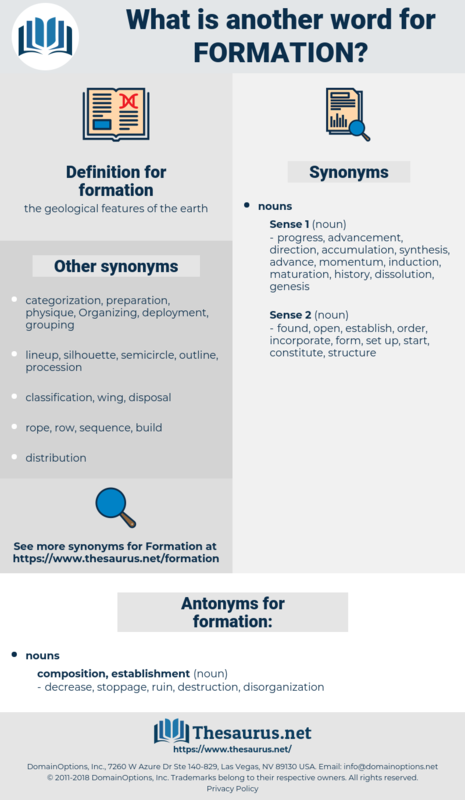 Forming, forging, reconfiguration, reconstitution, formative, apparition, acquisition, reformulation, accumulation, definition, build-up, composed, realization, constitution, inculcation, operationalization, integration, education, onset, framing, upbringing. developed, conducted, enrolled, Provided, required. needs, Trainings, composition, configuration, configurations. line-up, form, composition, configuration, makeup, grouping, birth. decrease, stoppage, ruin, destruction, disorganization. Thought I'd like to get my hand in a bit before we go out in squad formation. Features that are based upon, or that grow out of the natural formation of the ground, will not only look better than the created features, but be more to the credit of the gardener, if successful, and will save expense. granulation, metalwork, filing, affixation, rifling, grooving, turning, forging, metalworking. flight, line, center, military formation, head, flank, rear, secondary, backfield, wing. fabrication, manufacture, Manufacturing, creating by mental acts.